Our new e-book Budgeting, Planning and Forecasting Gets an Upgrade is a three-part guide aimed at helping you figure out how to consider and use software to improve those budget-centric processes. 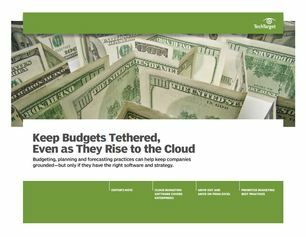 Regardless of what type of budgeting software may be on the horizon for your company, this guide provides some key tips and insights about how to make the most of a big purchase. Claiming this valuable resource is easy! Answer a few questions on your HR software challenges and upcoming initiatives and immediately receive your copy.